Germany: 'My Cake' to premiere in Berlin! 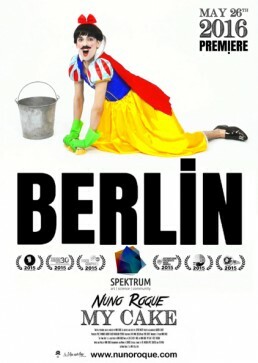 After much anticipation, Nuno Roque’s My Cake will premiere in Germany on May 26th, 2016 at the SPEKTRUM (7 p.m.) as part of the ‘Transformation‘ exhibition screening night in Berlin. My Cake has already been screened in many countries around the world since its premiere last year at Mons European Capital of Culture. The venue is part of a monumental architecture in the heart of Kreuzberg/Neukölln created by Franz Hoffmann and Bruno Taut, one of the main expressionist architects of the modernist period, and aims to bring confrontation, open knowledge and a platform for the presentation of technology-based artworks.